Comments: In March 2008, the additions to my HOF collection slowed down. It was hard to find some of the cards I was missing, or very expensive to upgrade others. In order to keep the collecting juices flowing I decided to diversify the collection a little by buying some cards of "Fan Favorites"- the players who might not make the Hall but were pretty good or famous in their own right. In some cases this included researching old-timers back to the 19th century. I included their names in my eBay searches. When tribute cards or items showed up with good portraits I'd pick them up. Offered for your consideration is...Divided back postcard ~ Kodak paper. 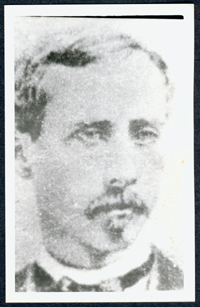 Deacon White (James Laurie White) ~ 19th Century Great (1871-1890) vintage photo postcard by Brace/Rowe/Burke. 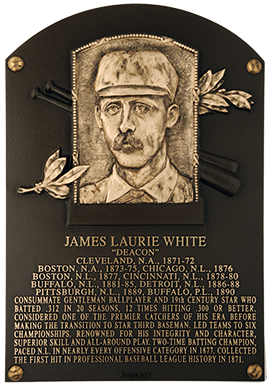 In 20 seasons he ranked as one of the 19th century's early stars; a someday Hall of Famer. Baseball hobbyists have long admired the work of photographer George Brace and George Burke before him. Brace succeeded Burke in the late 1940's after having worked with him for several years before that. In later years, Berwyn, Illinois, photo seller Jim Rowe sold Brace/Burke photos to both collectors and ballplayers themselves. We suspect this card to have been created by either Brace or Rowe from a Brace or Burke negative. Offered here is a fine old photo postcard measuring approximately 3-1/2" by 5-1/2". 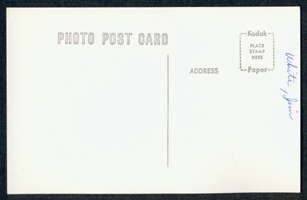 The reverse features a divided back with "Photo Post Card" above the message portion. The address portion has a stamp box with Kodak Paper framing "place stamp here". We believe this card was produced in the 1960's or '70s. The subject(s) is identified in ink or pencil on the back - standard practice for both Rowe and Brace. According to the Beckett Alphabetical Baseball Card Checklist, an exhaustive reference guide, this man appeared on fewer than a half dozen baseball cards. Condition appears to be Excellent plus. I couldn't have asked for a better consolation prize! Here's a little more about Mr. White if you are interested. UPDATE: In late November, 2013 I included the Brace/Rowe postcard in a submission using a 15-free gradings voucher I received from PSA for joining their Collectors Club. I posted a sticky on this one telling PSA its a Brace/Rowe postcard. Still, I didn't think they would slab it because it would take a little bit of research to confirm the player, etc, and I was right.....frustrating! It was in a 2005 auction catalog that Rob Lifson of Robert Edward Auctions came clean about the origin of the “Scrapps Tobacco” name. “The responsibility for this erroneous attribution, we must admit, falls squarely on the shoulders of Robert Edward Auctions’ President Robert Lifson.” Lifson then proceeds to explain that in 1974, while working on the Sports Collectors Bible, he was fact-checking with hobby pioneer Dr. Lawrence Kurzok. 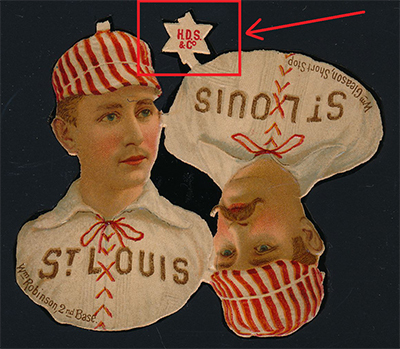 When Kurzok verified that the cards were “Scrapps,” Lifson interpreted this as “Scrapps Tobacco.” The issue was published in the Sports Collectors Bible this way, and has been known by that moniker ever since. The reality is that no “Scrapps Tobacco” brand has ever existed, and that the word “scrapps” was merely a catch-all term used to describe die-cut paper cards meant to be glued into 19th Century scrapbooks, a popular hobby of the time. Perhaps these cards can provide a clue. Two separate lots, each containing an attached pair of “Scrapps Tobacco” cards. These cards represent two of the only three such attached pairs we have ever encountered, two of the only three such pairs our research has been able to uncover. Quite an incredible find, representing two pair, one of Hall of Fame Wolverines Ned Hanlon and Sam Thompson, and the other of the Browns’ Bill Gleason and Yank Robinson. Each card is spectacular in appearance (though the Hanlon/Thompson card is graded SGC FAIR 20 due to two tiny pinholes at Sam Thompson’s shoulder. The cards are intact, the die cuts and tabs still remaining. “Prominent among our Cincinnati industries is to be found the well and favorably known house of HD Smith & Co., manufacturers of confectionery and chewing-gum, making a specialty of the latter. Their goods are known and sold from Maine to California. Among their large variety, the brands “Red Riding Hood,” “Crystal Palace,” “Beauty,” “Cough,” “Excelsior,” and “Ylang Ylang” are the most prominent, and which the trade at large are familiar with. 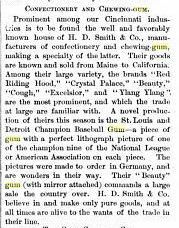 A novel production of theirs this season is the St. Louis and Detroit Champion Baseball Gum – a piece of gum with a perfect lithograph picture of one of the champion nine of the National League or American Association on each piece. The pictures were made to order in Germany, and are wonders in their way. Their “Beauty” gum (with mirror attached) commands a large sale the country over. H. D. Smith & Co. believe in and make only pure goods, and at all times are alive to the wants of the trade in their line." This paragraph, coupled with the “H. D. S. & Co” printed on the tab of the Gleason/Robinson pair, leads us to believe that the mystery surrounding the origin of “Scrapps Tobacco” cards has been solved. These are actually “H. D. Smith & Co. GUM cards,” likely issued in early 1888, and quite possibly the earliest gum cards ever issued, if they predate the G&B Gum issue of that same year. 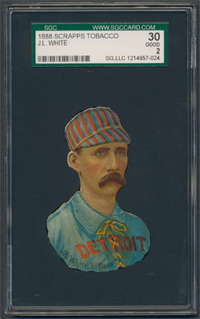 At the very least, they appear to be the hobby’s first full-color gum cards, and quite likely ­­were distributed the same way as the “Scrapps” presidents card. We are pleased to present you with two lots that represent two of the three attached pairs of 1888 H. D. Smith & Co Baseball Gum die-cuts, the very cards that helped solve the longstanding mystery of Scrapps Tobacco, and quite possibly the first commercially-issued baseball gum cards. Just a couple days later, one of the 1888 H.D. Smith & Co. gum cards showed up on eBay, a Deacon White nonetheless, and it was calling my name. I watched the auction over the course of the next week. Just in case, a snipe was recorded. It wouldn’t be needed because final auction day came and I monitored it hourly. I took Friday October 24th off to take the kids to the Wings Over The Rockies Air and Space Museum. My cousin was visiting us from Poland so he joined in on the fun. Throughout the visit I kept refreshing the auction on my iPhone. As we were exiting I timed a final bid with seconds left. The price climbed but I won – finally, almost two years after his induction – I had my Deacon White! Set Name: H.D. Smith & Co. Description: The origin of these die-cut, embossed player busts is not known, but they were apparently part of a book of "punch-outs" issued in the late 1880's. When out of their original album, they apparently resembled scraps of paper, presumably leading to their unusual name. An earlier theory that they were issued by "Scrapps Tobacco" has since been discounted after research indicated there never was such a company. 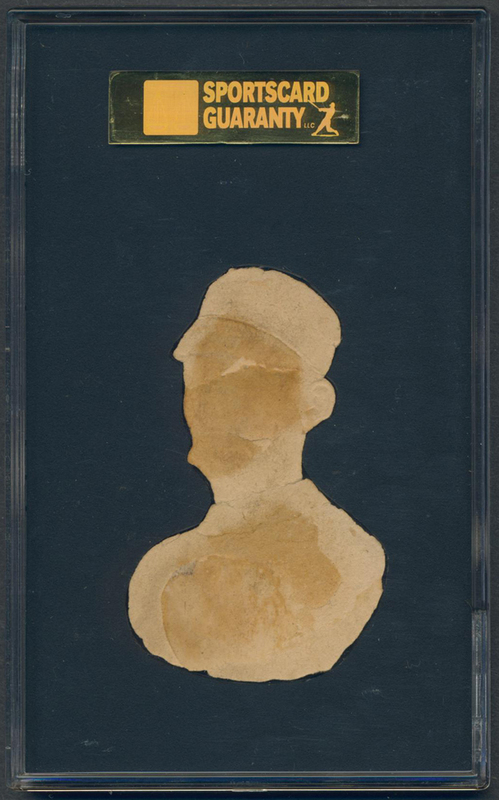 The die-cuts include 18 different players - nine members of the American Association St. Louis Browns and nine from the National League Detroit Wolverines. Although they vary slightly in size, the player busts are generally about 2" wide and 3" high. The drawings for the St. Louis player busts were taken from the Old Judge "Brown's Champions" set. The player's name appears along the bottom.